I love making quesadillas. They are super versatile since you can fill them with pretty much anything and they are just gosh darn tasty. The gooey warm fillings combined with a crisp exterior is just perfect with some cool salsa. 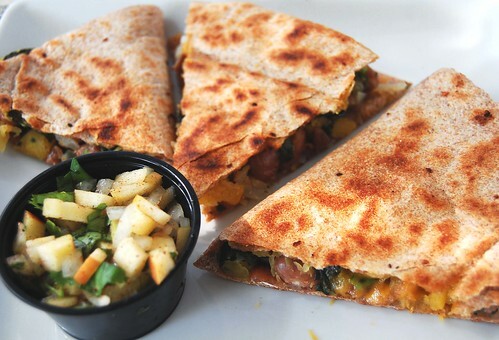 I make quesadillas often in the summer time since there are so many awesome summer vegetables to stuff them with, plus yummy tomatoes for pico de gallo (aka salsa). This time, I wanted to try a more autumnized version of quesadillas, because hey, Fall has some great vegetables to offer too. I went with acorn squash and spinach. I also wanted to make a yummy autumnized salsa so I decided to make a sweet, spicy, and tangy apple salsa. This combination was fabulous! The quesadillas rocked (as expected) but the salsa was AMAZING. No joke -- I seriously made a bunch of extra salsa and just ate it all on its own, it was that good. If you don't want to make the effort to make these 'dillas (although they are not difficult) you should still try this salsa. Even if you end up eating it out of the bowl like me. 1. Roast the acorn squash in the oven for about 20 min, until softened, but not mush. 2. Heat the oil in a skillet, and cook the onion for about 5 min. Add the squash, spinach, and garlic, and cook for about 10 minutes. Stir in the beans, cumin, and salt and pepper. (Here's a secret: I also do this step in...the microwave! Yes, when I don't have the patience to stand over the stove, I put all these ingredients in a bowl and nuke 'em for about 2 minutes. And you know what? I can't tell the difference). 3. Add a few drops of oil to a hot skillet. Place a tortilla on the skillet and add to one side half the squash mixture and half the cheese. Fold over and cook for about 5 minutes on each side, until crispy and browned. Repeat for other tortilla. 1. Combine all ingredients in a large bowl and mix thoroughly. 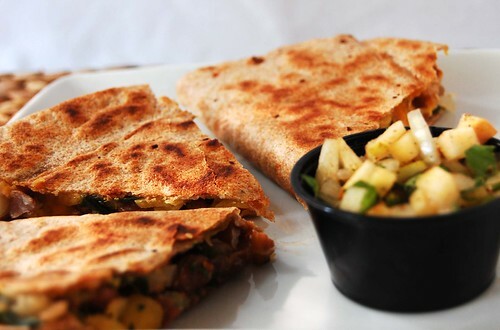 I totally agree with you: What's not to like about quesadillas? What a great dish! The apple salsa is such a good idea, I have to try it soon. I love quesadillas! I have never heard of apple salsa...interesting. By the way, I gave you an award on my blog! Congratulations! I love all the veggies in here and the salsa looks amazing!